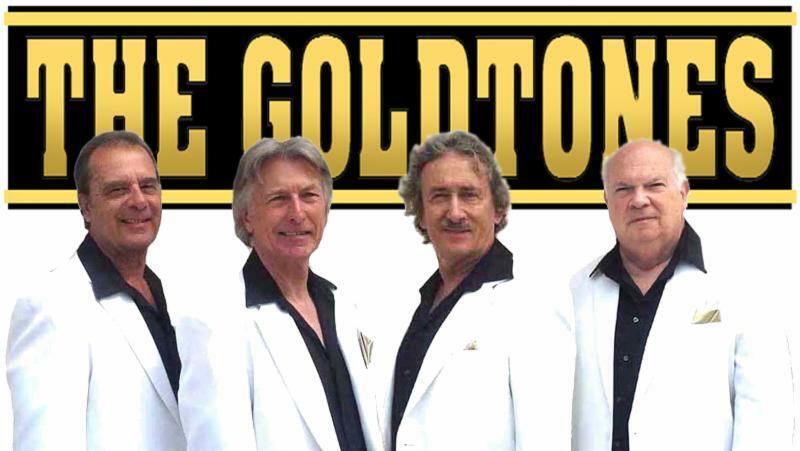 VENICE, FL, SEPT. 1, 2016 - The Venice Theatre Guild invites audiences to enjoy a night of nostalgia, music, and fun when The Goldtones take to the MainStage Saturday Sept. 17, 2016. The concert is at 8 p.m. and tickets are $22. They are on sale now at the theatre’s box office, by phone at 941-488-1115 or online at www.venicestage.com. Proceeds benefit families in need of scholarships to participate in Venice Theatre’s education programs. T he Goldtones have been called the “hottest doo-wop group in Florida” and entertain their audiences with the sweet sounds of street-corner harmony and favorites from the ’50s, ’60s and ’70s. The group is back by popular demand after performing at Venice Theatre for three years in a row. The summer oldies concerts are an annual tradition of the Venice Theatre Guild and have raised thousands of dollars for the education scholarship fund. Venice Theatre is located at 140 W. Tampa Ave. on the island in Venice. Summer box office hours are 10 a.m. to 3 p.m. Monday through Friday and one hour before all performances. Full-time hours (Monday through Friday until 5 p.m. and Saturdays from 10 a.m. to 1 p.m.) begin again Tuesday Sept. 6, 2016. John has been performing professionally since 1958 at the age of 12. John has worked closely with many famous performers such as Walter Becker and Donald Fagan (Steely Dan), The Brooklyn Bridge, the Coasters, the Dovels, Acadamy Award winning song- writer Frankie Previtte (Dirty Dancing) and many more. He also worked as an actor for eight years. His work included a steady role for five years as a prison guard on the HBO dramatic series "OZ", appearances on "Law and Order", "Ed" and motion pictures such as "The Siege" "Runaway Bride", "The Interpreter," and "Analyze That." Ed started singing professionally at 18 with the original five-man group "The Orkells" in New Haven, CT. He later teamed up with a friend to write and produce music as a duo and with other regional artists. He published several songs and recorded on the Beltone Record Label and registered with "Broadcast Music Inc." (BMI) Ed's music arranger was Joe Rene who wrote many R&B songs, including "Tossin & Turnin" sung by Bobby Lewis. Later. Ed’s continued love for music and entertainment landed him a position as Marketing Director for the SNET/Oakdale Musical Theatre in Wallingford, CT. This was a 5000 seat theater, second in size only to Radio City Music Hall in New York City. Ed now lives with his wife Annette in Punta Gorda. Gary started singing in the early '60s in his hometown of Milford, CT. He sang in coffee shops, school assemblies, and with local band Station VI, where he met his future wife Ginger while doing a gig in her neighborhood. Gary's interests turned eventually to theatre, where he has become an award winning actor and director. He has worked in TV, dinner theatre, cabaret, commercials and hosted his own call-in radio show. Mike grew up in the Philippines where at the age of five he began harmonizing on church stages with his family. As a young man in Manila he joined The Madrigals ‘n Guys developing a passion for tight harmonies and live performance. After cutting a record, they toured the Philippines, Europe, and across the USA, frequently entertaining our troops at military bases. While in college, Mike received formal voice training as a solo performer. With The Abundant Life Singers, he recorded several albums and toured in Australia and across the USA. He transitioned to singing oldies as a founding member of the vocal band, Classic Blend. The group performed and recorded standards, jazz, doo wop, Motown tunes, and covered the tight harmonies of Manhattan Transfer.